Sports Trading is Sports Betting on steroids! Sports trading promises more profit potential and a greater return on investment (ROI) in comparison to conventional sports betting. Why's that? More profit potential and a greater return on investment (ROI), in comparison to conventional sports betting, is one of the reasons that more and more sports bettors are turning towards this new way of betting, known as sports trading. In theory, the profit – which is always expressed as the percentage of return on invested capital – is bigger in sports trading. That is because of the possibility to place multiple bets (in other words, execute more trades) in a short period of time. The quick release of the money after a successful trade and the constant execution of new trades result in soaring turnover. Thus, there is no need for a large margin, in order to record significant profits after successful predictions. An edge of less than 1 percent is possible to produce monthly return of over 100 percent! Yet, the actual advantage is much less than 1 percent! In conventional sports betting a reasonable edge is acknowledged to be around 5 percent. According to value betting theory, betting at 5% edge makes money in the long run. However, how many value betting opportunities will we come across during a month? 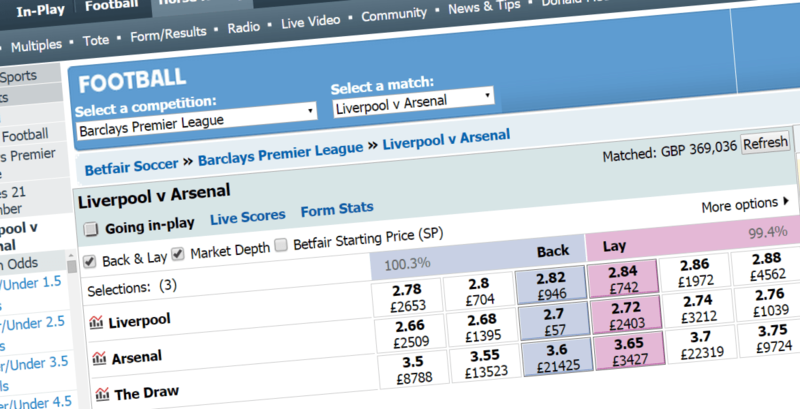 Assuming that competition – other bettors and online bookmakers – constantly offer several attractive odds for value betting, let us look at the options we have based on our bankroll. If we follow proper money management strategies, betting only 2% of our capital on each bet, we can simultaneously place 50 bets on various games. Suppose we manage to come up with 10 matches per day offering 5% edge. Overall, we expect to earn 1% profit every day, by placing bets using 20 percent of our capital. In this case, the capital increase will be 30% at the end of the month. On the other hand, in sports trading we record both a percentage of successful trades and an average profit per trade. Let us assume that 40 percent of our trades are proven correct, and, for example, the odds drop from 2.00 to 1.98 each time, gaining 2 ticks on average for every trade against one tick for each losing trade. Simply put, we risk 1 tick and target a profit of 2 ticks. In this case, we increase our capital at a rate of 0.1%… per trade. Moreover, after each trade our money is again available for the next trade. In contrast, when we bet on a match we should wait till the game is completed to recover our profits. Consequently, in the 10 minutes before the start of a horse race, a trader could comfortably complete 10 trades (1 trade per minute) gaining 1 percent on all predictions combined, while a bettor who bets on the odds of the race can possibly win only one bet, accounting to 0.1 percent of the capital. Similarly in football, according to the above betting system, a bet wins 0.1%. However, a trader has 90 minutes in their disposal to place multiple trades without having to wait for the final outcome of the match. If the player, who bets on 10 matches daily according to our previous example, decides to trade 4 times per day implementing the same winning system, then it is possible to record a capital increase of 120 percent per month. Actually, the player has placed 4 times more bets by trading, compared to sports betting, with the exact same capital. In other words, the trader has increased 4 times the opportunities for winning, compared to the possibilities offered by sports betting. Of course, in the examples above we have used extreme theoretical cases to compare trading and conventional sports betting, in which the advantage of a trade was eventually equal to the advantage of a bet. Finally, we should not disregard the higher risk involved in trading compared to betting, which could affect our whole capital. So, is trading really easier than betting? Previous articleMoney Management Basics: What is Drawdown in Sports Betting? When to Quit Betting? When you’ve lost Enough!